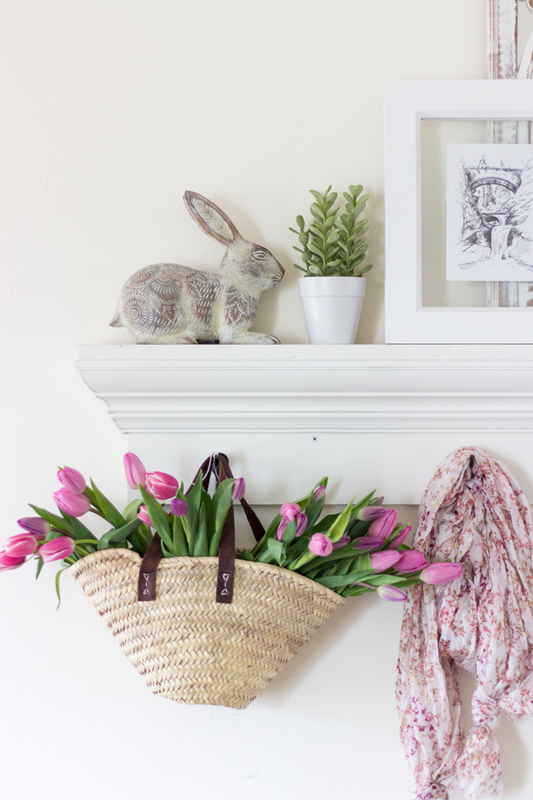 Today I’m sharing how I created a welcoming entry for spring. 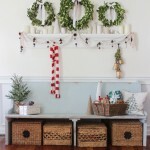 This post breaks down how I styled my entry, and why I did what I did, so you can create something similar in your home! 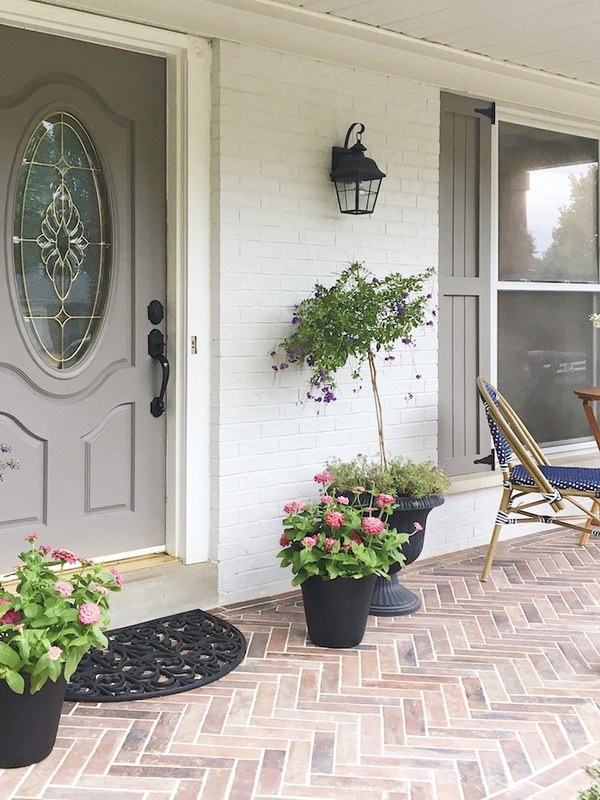 I’m also joining 25+ bloggers hosted by Jennifer from Town & Country Living each sharing a space in their home decorated for spring with the process for each one. Talk about an incredible learning experience! Big pretty potted flowers aren’t available in stores yet, so I pulled this shot from my phone last fall when it was being photographed for BHG’s Refresh Magazine due out on March 13th! 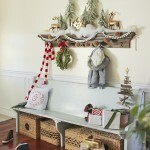 This is what I wish my front door looked like right now! 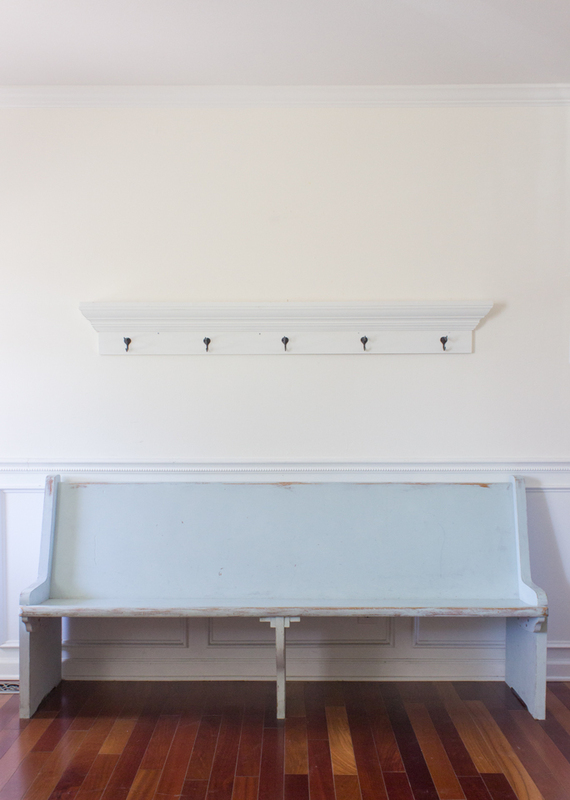 Right after you walk into my front door, you will be greeted by my entry bench and shelf! 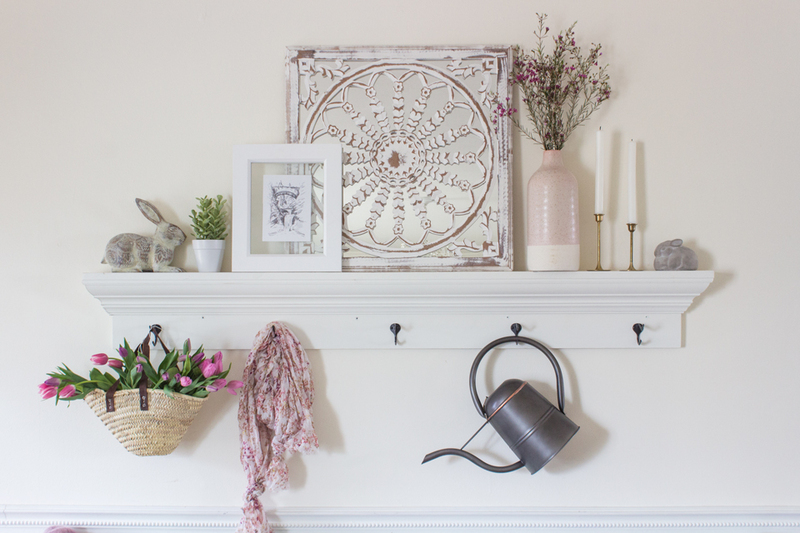 Tutorial for shelf with hooks found HERE! Pretty boring right? 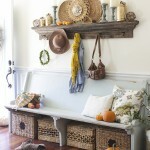 I even took out the baskets that I have had under the bench for years! I bought, 1 wood medallion/mirror, a pink vase, a pillow and a throw at HomeGoods, a concrete bunny and small faux plant at Target, and a wood rabbit, a pillow, and a watering can at World Market. Everything else I used were things I already own. Here is an animated GIF I created showing how I put it all together. 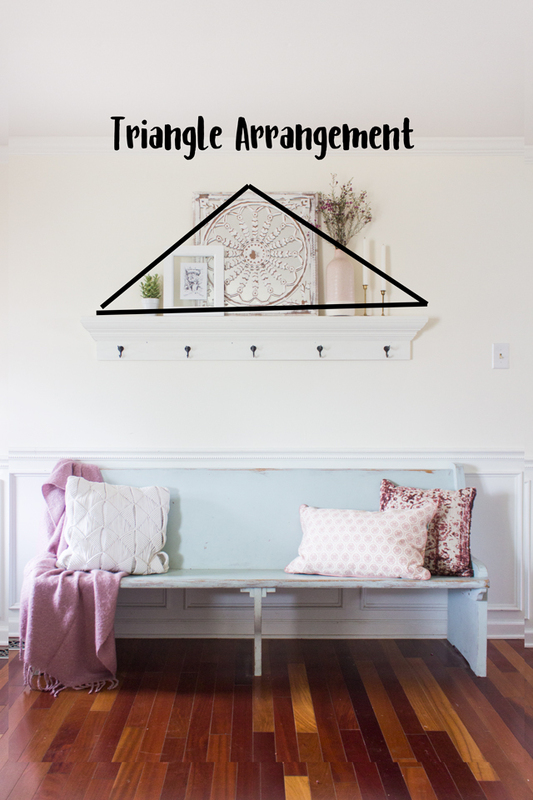 A couple important take-aways… think about a triangle arrangement when you are styling a shelf like mine or a mantel. There is something very pleasing to the eye when grouping several objects of different textures together in a triangle shape. It’s sort of a no-fail method! 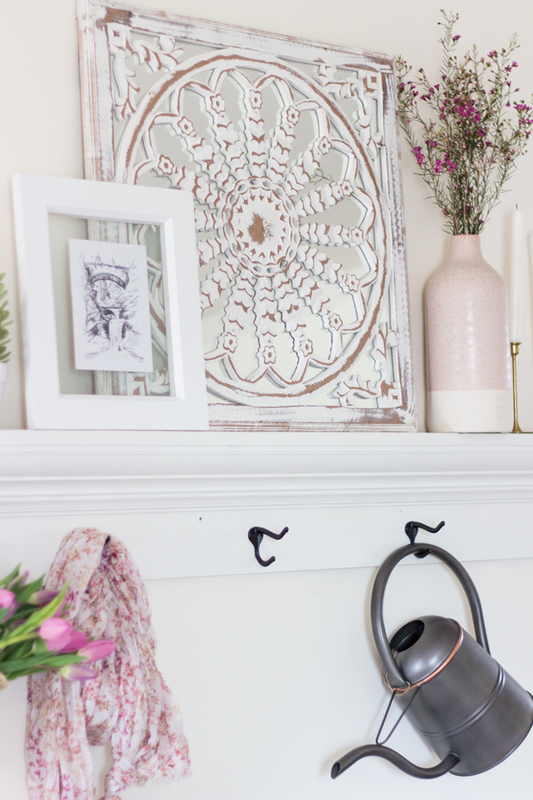 Also… while we all know in reality many of these hooks are home to a purse or backpack, it’s always fun to hang something fun and pretty on them too! 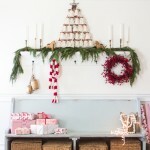 When doing this, especially if you are taking pictures of it, think about the different lengths of what you are hanging. You don’t want all of them to hit at around the same spot… some variance always looks better! Check out my friends’ spaces below! That is beautiful! Thanks for the triangle knowledge. I am redoing my back door space. 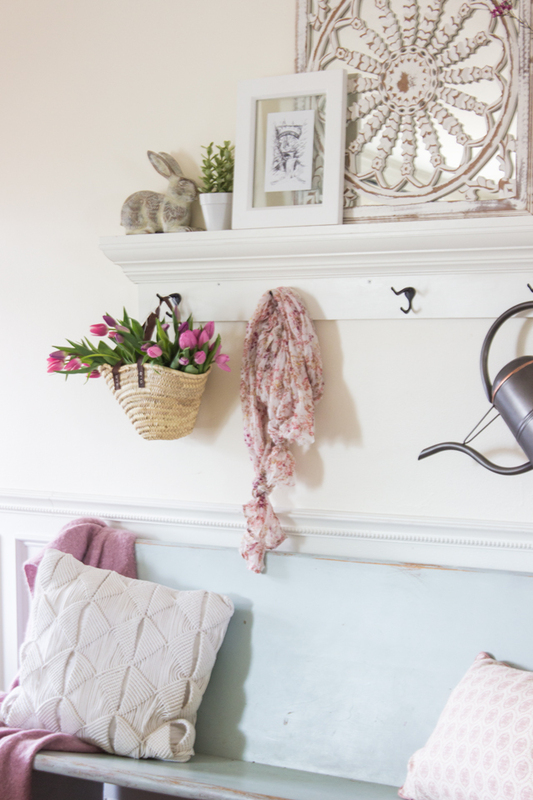 Where did you get the shelf with hooks? 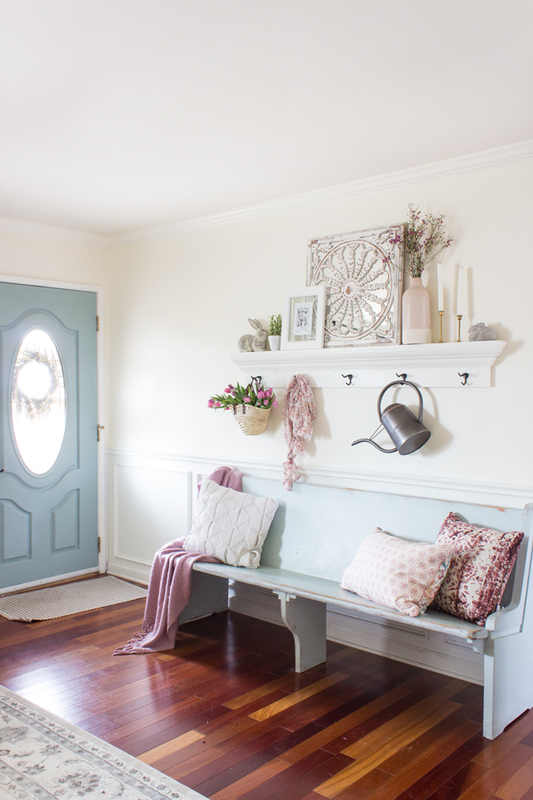 Such a beautifully styled spring entry! I love the GIF! Brilliant! 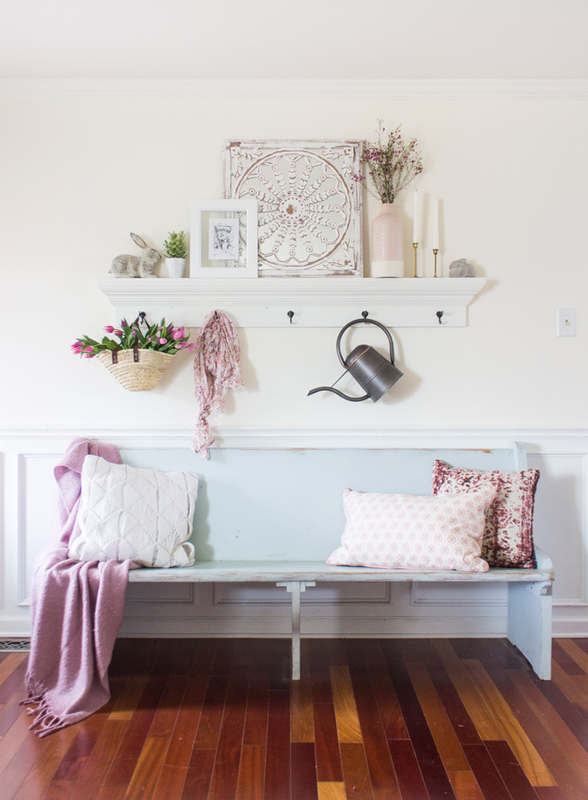 Love your tips and use of soft colors, Rachel. The animated gif was a fun surprise! Thanks so much for being part of the tour! Your ideas are banging! 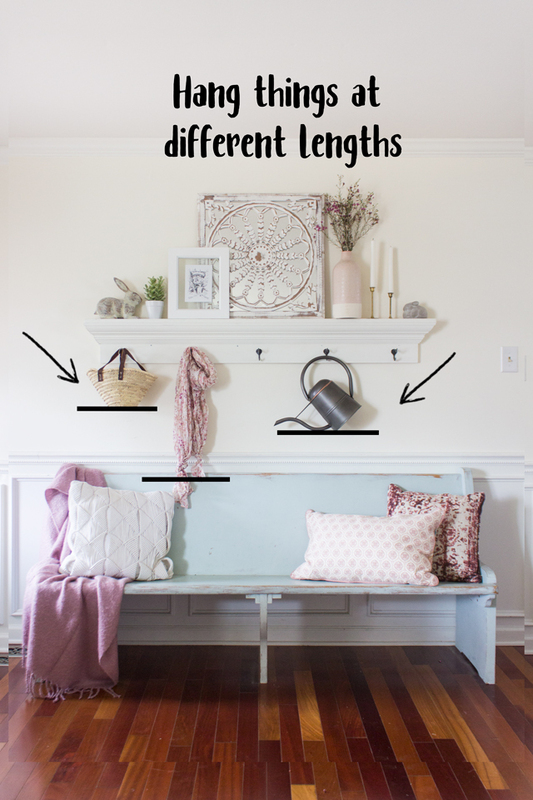 I would have never thought to hang items at different lengths/heights. Sooooo beautiful. 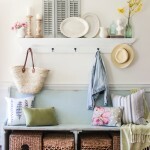 I also love the type of items you placed on the shelf and tge hooks. The bench is smoking fabulous. Thanks for the tips.